Nerf Firevision Sports Football | A Savings WOW! 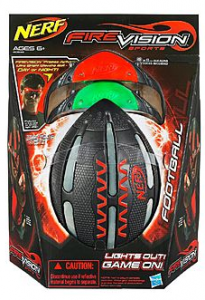 Nerf Firevision Sports Football – Only $8.99 Shipped Today! Here’s a fun gift for your football fan – the Nerf Firevision Sports Football! Our kids have it and love playing with it. The really fun part is that you’ll be able to play football, even in the dark when you wear the Firevision Frames. You can play for hours without charging it and it has a 100-foot range. The kids can choose their teams with red or green Firevision Frames. The set comes with the football and 2 pairs of Firevision Frames. 1) Get $3 in free points through Shop Your Way. Sign up for your free Shop Your Way account here. Be sure to select “I Agree to Personal Shopper Terms and Conditions,” then click NO to “Are you a Sears Holding Employee?,” and then click on next. If you are already a Shop Your Way member, select the “already member options” and follow the prompts to link me as your personal shopper. If you are new to selecting me as your personal shopper, you will be awarded $3 in points and qualify for 90 days of free shipping as a thank you. 2) Next, use this coupon for $3 off your toy purchase of $10 or more at Kmart. Click on “get deal” to get the coupon code to use online. Click on “Shop Kmart.com” and search for “Nerf Firevision Sports Football.” It is on sale today for $14.99 (usually $20.00). Add it to your cart. 3) When you go to checkout, make sure to add the coupon code under “Apply Coupon Code.” It will bring down your new total to $11.99. With your Shop Your Way account, you should free shipping through Shop Your Way Max. If not, you can select a store to pick it up there for free. 4) Use the $3 in points you were awarded when you signed up for your Shop Your Way account or linked your account to me as your personal shopper to bring down your total to $8.99 with free shipping! * Note: If you use Ebates to make your purchase, they are offering 10% cash back for today, which will make your new total $8.09 after cash back! This is a really great deal for this football. It is selling for $24.99 at Toys ‘R Us and $21.03 on Amazon.com. It’s also a good thing to add to your gift closet for birthdays and special events throughout the year!